This library of printed books is dedicated to Arya Sudharmaswami, the first orator of the Jain scripture. More than 1, 00,000 printed books and 10,000 periodicals related to Jain and Indian culture are stored and preserved here. 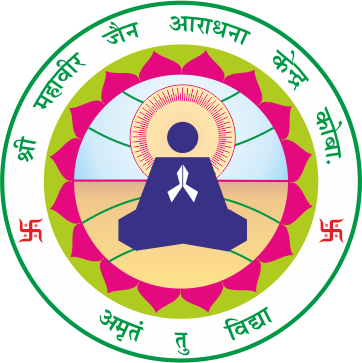 The systematic scheme has been planned to enrich this collection, so any knowledge seeker of Jain religion can gain satisfaction of achievement by visiting this place. Mostly, Sadhus-Sadhvijis (monks), Mumukshu, Shravak and researchers are the users of these books. The highly detailed information on the computer is available here for this rich collection of scriptures, books and periodicals. All the procedures of exchange including availability and search of the books are handled by very easy way and with convenient computerized system. The books are received from two sources. Either they have been purchased or have been presented by a donor. Anyone can donate books to the library. If the books are found useful and of academic/spiritual value, they will be accepted and entered in the catalogue. The remaining books will be returned to the donor. But if the donor does not desire to accept them back (or for any other reason) such books will be sent to some other library, any time after a month. Thousands of such books have been given to other gyanbhandars.